Like its northern sibling Messier 101, the Southern Pinwheel Galaxy has numerous star forming regions and its arms are dominated by young stars, giving similar appearance to these galaxies. The galaxy was discovered by Nicolas Louis de Lacaille French astronomer in 1752 at the Cape of Good Hope, where he travelled to measure the distance of planets using the parallax method. During his two years long expedition he catalogued almost 10000 southern stars and 42 nebulous objects, including the Southern Pinwheel Galaxy. Besides these discoveries he could fulfil his original aim to measure the planet's parallaxes. Messier entered the galaxy in his catalogue under #83, almost 20 years after de Lacaille's death, in 1781. The galaxy is situated in the direction of constellation Hydra, at a distance of 15 million light-years, at the centre of M83 Group of galaxies named after the galaxy itself. The compact group has 15 members. Interestingly, its neighbour group, the Centaurus A Group, is quite close to it, also their relative velocity is almost zero, thus these two groups are often referred as one group called Centaurus A/M83 Group. The two groups have 44 members altogether. Size of the Southern Pinwheel Galaxy is only 55000 light-years, a bit smaller than the half of our galaxy, the Milky Way. Measurements regarding the mass distribution within M83 suggest that the galaxy has double nucleus, similarly to Andromeda galaxy. This double nucleus is thought to be composed of one super massive black hole surrounded by an asymmetric disc of stars. Surprisingly, the nucleus of M83 is not at the kinematic centre of the galaxy, but a bit offset. The galaxy's de Vaucouleur classification is SAB(s)c, meaning a weakly barred spiral galaxy, with no rings around it, having loose spiral arms, just like the Milky Way. The bars are taught to bring gases needed for star formation from the outer regions to the central part of the galaxy. These gases are powering star formation in the central region, and also being absorbed by the central black hole. This theory also explains why the core regions of barred spiral galaxies are so bright. 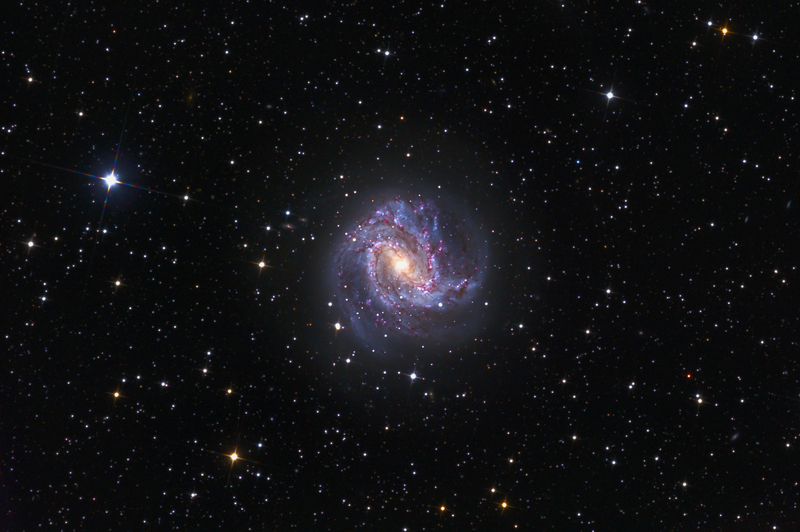 M83 performs well regarding supernovae as well. Six of them could be observed in the galaxy, which is outshined by only one galaxy, NGC 6946, the properly named Fireworks Galaxy. Besides the six observed supernovae in M83, there are almost 300 supernova remnants as well.